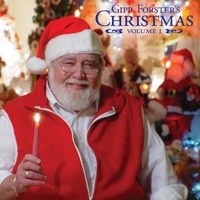 The rich voice and warm holiday writings of Gipp Forster, with original music by Dale Baglo. An almost hour-long tapestry of voice and music. Gipp's pen is like a paintbrush—creating vivid images of Christmas: from trees wrapped in tinsel... to children rapt in wonder. For maximum enjoyment, we suggest you listen in a room lit only by a crackling fire and a sparkling Christmas tree, while snuggled under a comfy Christmas quilt and sipping from a steamy mug of hot cocoa. Gently falling snow optional. All stories written and narrated by Gipp Forster. Original music and lyrics composed by Dale Baglo. Public Domain carols played by Bill Sample. Snowsong sung by the Sinclair Academy Singers, under the direction of Anne-Marie Brimacombe. It Feels Like Christmas sung by Duncan Meiklejohn. Produced by Dale Baglo. Recorded & Mixed at Dale Baglo Broadcast Inc.